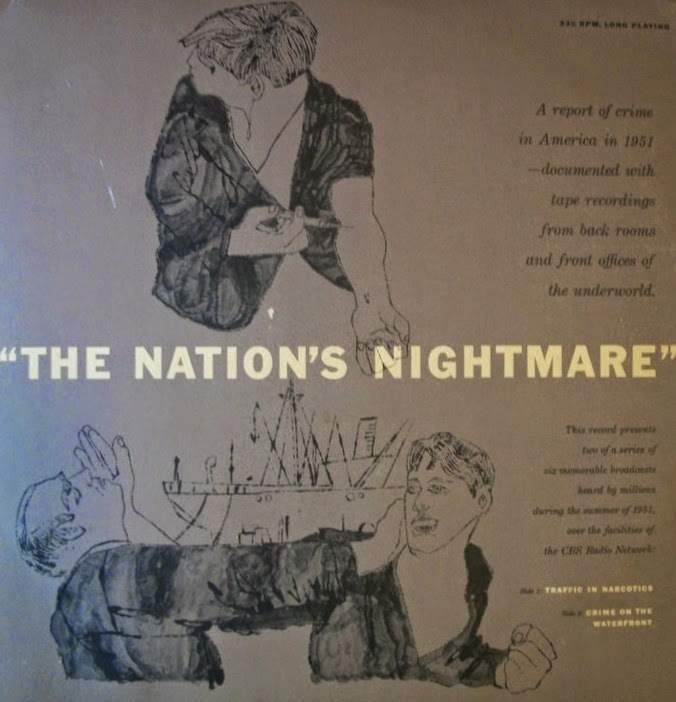 In late 1951, CBS Radio aired a six-part series entitled "The Nation's Nightmare," narrated by Bill Downs. Each was a half hour long, and two parts, "The Narcotic Evil" and "Crime on the Waterfront," survive today in the form of a rare print, highly sought-after LP record. The record is valuable because the cover art was designed by a then-unknown Andy Warhol, who in 1951 won a contest in New York held to design the cover. Because there were only about 3,000 copies made, the album usually sells from anywhere between $600 to several thousand depending on the cover's condition. "... radio was the big business of CBS then, television was the step-child growing up... and you could see that one was going to take over, there was no question about that, so we wanted to keep [radio] alive and vital... Andy Warhol had the visual impact that I wanted for such a subject. There's a gritty quality about the style... [Ben] Shahn brought the same thing to it; that's where I cast Andy in that role... I'd say... what about a guy shooting up; here's the layout I'm doing and I don't want to restrict you... I just explained to him what the program was all about... and left it to him... A big difference between an artist and a graphic designer... is that the artist works in quiet desperation all by himself and advertising is a big collaboration... Silk screening Monroe twelve different ways and different colour breakdowns is fine - it's a graphic design schtick... to me that's graphic design, I could do that. Would I have thought of doing twelve Monroes? I don't think so. I wouldn't have thought of it as a great accomplishment but they're very gorgeous women..."
In many sales descriptions the recording itself is described as bizarre, and "The Narcotic Evil" is compared to "Reefer Madness" and dismissed as a bit of a novelty. But the description (also published in Newsweek) on the back of the album cover gives a little more insight; it was a long, heavily researched documentary piece on crime in the United States with quality content, despite the use of phrases like "the animal screams of a marijuana-crazed addict." It was still very much a time in which television and radio had their own strengths, and the article stresses heavily the ability of radio to capture what television could not at the time. As far as CBS was concerned, the well-televised Kefauver crime-investigating committee had done a great job in exposing contemporary American crime. But exposure wasn't enough. The people had to act to clean up the slime, and they had to be needled constantly to act. To do the needling, CBS turned to radio. Last week, The Nation's Nightmare (CBS, Thursday, 8:30-9 p.m. EDT) dug into the muck of the bookie business. In the previous two weeks the program had outlined the dope problem and the pattern of casino and slot-machine operations in the United States. Still to come are three more shows—on the policy and numbers rackets, waterfront crime, and gambling in sports. Here was no rehash of old material. 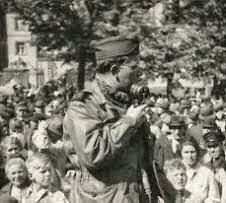 Irving Gitlin and his CBS documentary crew had gotten new information on the underworld. The New York Times called the series "a solid contribution in the interests of an informed public." Harriet Van Horne, radio and TV editor of The New York World-Telegram and Sun, wished in print that "television would shut down Thursday evenings at 8:30 so that everybody could turn on the radio." Gitlin had started his research by reading the entire fourteen volumes of the Kefauver testimony. He then dispatched telegrams to every CBS station asking for specific local crime information, help in lining up talkative stooges, live or on tape recordings, CBS reporter David Moore was dispatched with his own recorder on tour of Eastern crime beds. Gitlin talked at length with Virgil Peterson, operation director of the Chicago Crime Commission, and with Judge Morris Ploscowe, chairman of the Commission on Organized Crime of the American Bar Association. From them he learned which local police departments could be trusted for help and what local crime commissions were active. Then the cloak and dagger work set in. In Miami, Moore went to see Honest Frenchie Gips, a reformed gambler who had been warned by former associates not to talk. The reporter was steadily tailed in Miami by an unknown thug. But Gips did squeal, and with the help of $25 or $50 bribes to other "little fish," Gitlin, Moore, and crew began to hear things. From Dallas, Texas, came a remarkable police recording. A hidden microphone caught a conversation between Herbert Noble, a warring gangster, and Harold Shimley, a big-time mob man who had come to restore peace between Noble and Benny Binion, another Dallas darkling. Noble wanted revenge on the murderer of his wife, killed in a plot designed to catch him. Shimley promised, in a slow Texas drawl, that we can get that [man] killed in the penitentiary." In Los Angeles, a local radio station had recorded the pathetic words of the mother of a doped son, describing the way in which pushers and addicts kept at her boy. "For a while they thought he was dead," she said. "I let them believe it. It was better that way." In New York, Gitlin went after Tom Kelly, head of the Continental Press, a race-track wire service, for a statement. For days, Kelly desisted, until Gitlin finally agreed to an interview which Kelly himself could edit. Gitlin and Moore became used to the company of petty squealers and to vague threats of retribution. They became adept at meeting unknown men in crowds, sneaking off to lonesome bars where they picked up information on microphones, sometimes hidden in cars or under tables. Last week the crew was still recording and had about 40 hours of tape, which was being edited down to about eighteen minutes per program. Where the televised Kefauver hearings produced drama from the sight of mobsters, The Nation's Nightmare had vividness in the sound of actual voices, of the animal screams of a marijuana-crazed addict, of little children describing the process of "main-lining" (see Medicine), of the roll of dice on a crap table—all caught by a tape recorder. Where the Kefauver committee threw down the raw material for all to see, the Nation's Nightmare pulled it together into sound object lessons, which when narrated by the dry voice of Bill Downs had a shock value rarely heard on the air. The waterfront show, scheduled for broadcast on Aug. 16, promises to make radio history. The Nation's Nightmare may very well be the year's finest documentary, a sure indication that television has a long way to go to beat the graphic pictures which sound can paint.